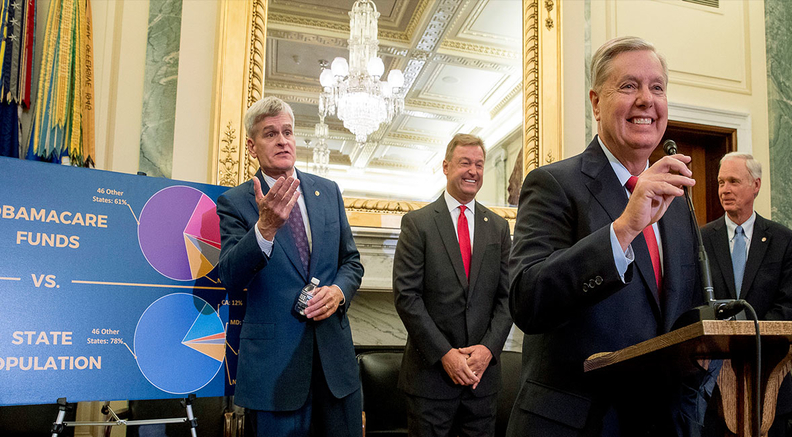 From left, Sen. Bill Cassidy, R-La., Sen. Dean Heller, R-Nev., Sen. Lindsey Graham, R-S.C., and Sen. Ron Johnson, R-Wis., hold a news conference on Capitol Hill in Washington, Wednesday, Sept. 13, 2017, to unveil legislation to reform healthcare. Three separate legislative trains, one from the right, one from the center and one from the left, are running down Congress' heavily mined healthcare reform tracks, and it's not clear which one will reach the station. Time is running out fast, at least for the conservative and centrist trains. That spells trouble for insurers, providers and patients heading into 2018. Healthcare industry groups hope the winner is the bipartisan initiative being crafted in the Senate Health, Education, Labor and Pensions Committee to stabilize the individual market and reduce premiums for next year. Chairman Lamar Alexander (R-Tenn.) and ranking member Patty Murray (D-Wash.) agreed that Congress needs to quickly fund payments to insurers for the Affordable Care Act's cost-sharing reductions to low-income enrollees. They hope to have a bill ready the week of Sept. 18. Insurers need to have certainty by their Sept. 27 deadline for filing 2018 plans and rates. But after holding four hearings, Republicans and Democrats on the panel seemed split over whether to give states and insurers flexibility to offer cheaper health plans with fewer benefits and/or higher deductibles. Time is short and the political differences are formidable for a bipartisan Senate effort to stabilize the individual insurance market. Alexander said he can't convince fellow Republicans to support a bill without flexibility to deregulate plans, while Murray said Democrats will stand fast against any erosion of consumer protections. Alexander also didn't back Democrats' and insurers' call for a new federal reinsurance program. GOP support for a market stabilization bill could be siphoned off by legislation unveiled last week by four Republican senators, led by Lindsey Graham of South Carolina and Bill Cassidy of Louisiana. They don't want to give up on repealing and replacing the ACA, despite the crash of efforts in July. The bill would take $1.2 trillion in ACA funding and ship it to states in massive block grants through 2026, with few strings attached on how to redesign their coverage systems. Like previous GOP repeal bills, it would end the ACA's Medicaid expansion; cap and cut traditional Medicaid; and repeal the individual mandate. Most political observers think the Graham-Cassidy bill's prospects are slim, since authorization to pass it under reconciliation rules, which require just 51 Senate "yea" votes, ends Sept. 30 and no Democrats support it. It's unlikely Senate Majority Leader Mitch McConnell will bring it up for a vote unless he's sure at least one of the three GOP holdouts on the last repeal effort will vote yes this time. That seems doubtful, especially with little or no time for hearings. GOP senators from Medicaid expansion states may be wary, since the bill is projected to shift hundreds of millions of dollars in federal funds from states such as Arkansas, Colorado, Kentucky and Ohio to non-expansion states such as Georgia, Tennessee and Texas. And hospital and other healthcare stakeholder groups will strongly oppose it. "Their best chance is to have the senators vote without looking at it, because the more these things get examined the more they lose altitude," said Tom Miller, a conservative health policy analyst at the American Enterprise Institute. From the left, Vermont Sen. Bernie Sanders last week introduced a Medicare-for-all bill. It had an unprecedented 16 Democratic co-sponsors, signaling growing Democratic movement toward a single-payer insurance plan. No one thinks the Sanders bill, which contained no financing details, has any chance in a GOP-controlled Congress. But liberals hope it could provide momentum for more incremental coverage advances—such as proposals to let Americans buy in to Medicare, Medicaid or another type of public plan option—particularly if Democrats win control of Congress next November. Still, don't underestimate the conservative hunger to gut Obamacare over the next two weeks. "A lot of colleagues are dying to have another shot," Graham said during a news conference unveiling his bill.